Choice Fasteners has been family owned since 2005. With over 100 years combined experience in the industry we stand ready to meet the needs of our clients both large and small. We pride ourselves in providing FAST turnaround for our clients and treating everyone we work with like family. We take just as much pride in fulfilling an order for one bolt as we do an order for thousands. We keep a large stock of nearly every kind of bolt, nut, washer, screw and countless other fasteners and in various finishes as well. Not only can you pick up your product locally, but we ship all over the greater Houston area, and the U.S.. We even ship international! So, no matter where you are we’ll get your product to you in a timely manner. Need to make a payment via credit card? Not a problem! Most credit cards are accepted. You can even mail us a check! Choice Fasteners provides exceptional quality insuring accuracy, conformity, and traceability to your order. 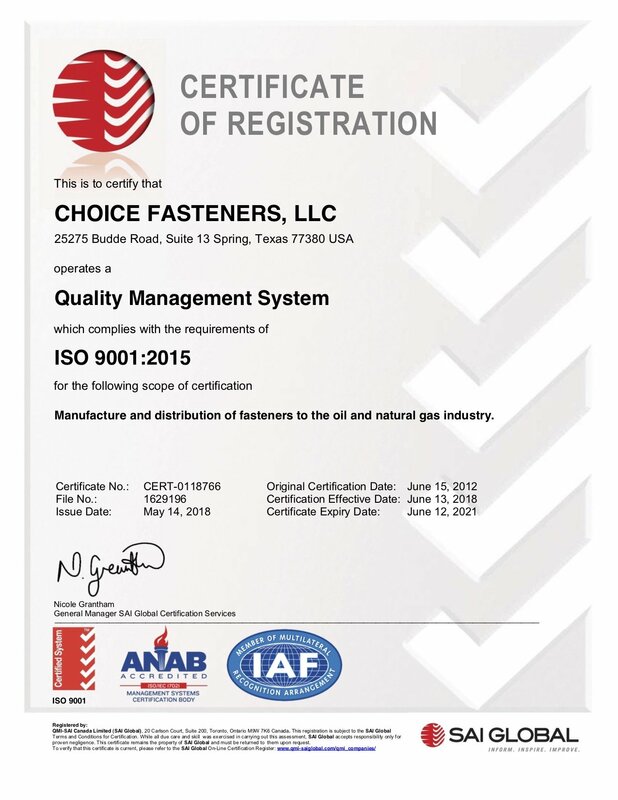 To ensure the highest quality, Choice Fasteners operates a fully registered quality management system to ISO 9001:2015 standards, and implements destructive and nondestructive performance testing. On the manufacturing level, regular conformance checking is conducted by quality control specialists in order to monitor product consistency. We will custom manufacture fasteners to meet your prints and specifications. Choice Fasteners is a quality manufacturer and distributor of an array of fasteners. We can provide you with all-thread, tap-end, and double-end studs manufactured to your specifications. We specialize in servicing the oil and natural gas industry.